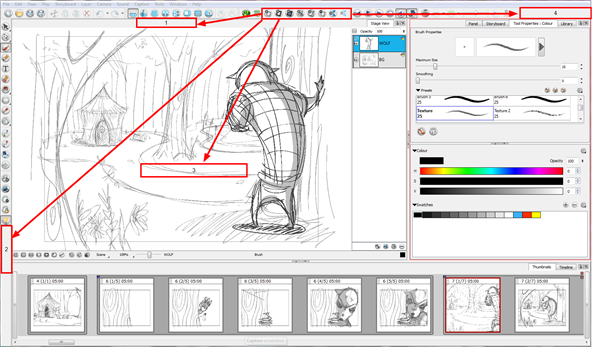 The Storyboard Pro user interface contains several useful toolbars which you can move around. You can reposition the toolbars to suit your work style or hide unused ones. ‣ Select Windows > Toolbars > toolbar. When a rectangle outline appears showing an available location for the toolbar, release the mouse button and drop the toolbar into position. Some of the toolbars can be customized to contain your favourite tools and options. Use the Toolbar Manager window to organize your different toolbars to suit your working preferences. Right-click (Windows) or [Ctrl]+click (Mac OS X) on any button in a toolbar and select Customize. ‣ Add a new icon to a toolbar: Select a tool/command from the Available Tools list and click the Right Arrow button. ‣ Remove an icon from a toolbar: Select a tool/command in the Toolbar list and click the Left Arrow button to move it to the Available Tools list. ‣ Reorder icons in a toolbar: Select a to move in the Toolbar list and click the Up or Down Arrow buttons to move it to the correct location. The Tools toolbar can only be customized by changing particular settings in the Preferences. 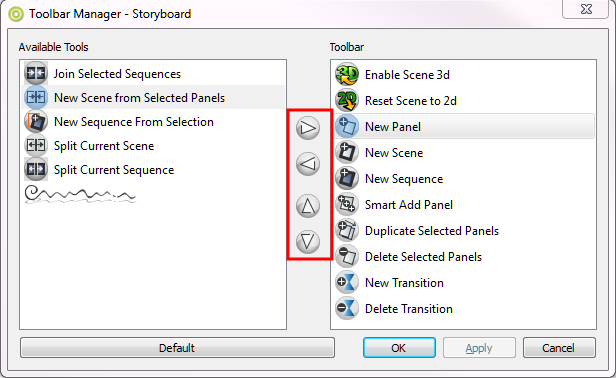 ‣ Select File > Preferences (Windows) or Storyboard Pro > Preferences (Mac OS X).